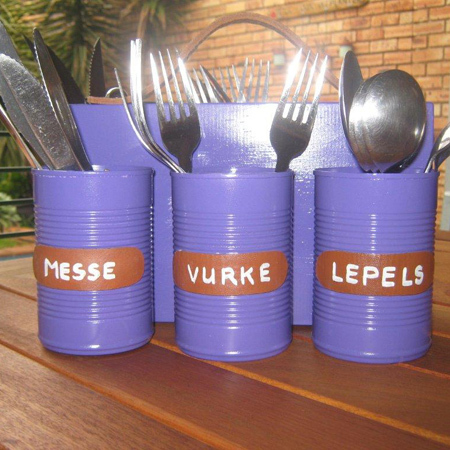 Use recycled cans to make a cutlery holder that can be used for indoor and outdoor entertaining. 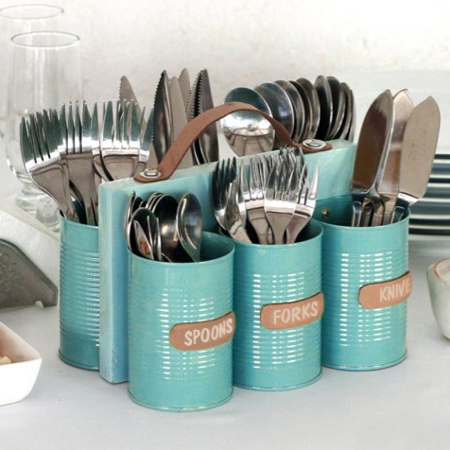 You can use six cans for cutlery or seven cans if you want to add a serviette holder at one end. Pieces of leather recycled from an old handbag serve as a handle and labels for the cans. Find all the tools and materials needed for this project at your local Builders Warehouse. 1. Use 80-grit sandpaper or a Dremel MultiTool and grinding stone to remove any sharp burrs around the cut edge of the can. 2. 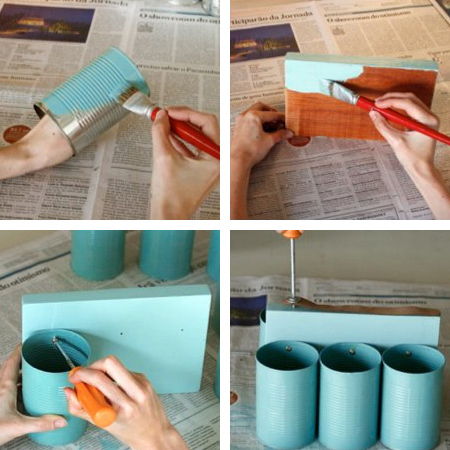 Paint the cans and block of wood in your choice of paint and colour and leave to dry overnight. 3. Use a wire nail and hammer, or drill/driver and 2mm HSS drill bit to put a hole at the top of each can, so that you can screw the cans onto the block of wood. If you are not using pine, you may need to drill a pilot hole into the board to make securing the cans easier. 4. Attach a piece of leather strap to the top of the block using a screw and decorative screw cup - shown right. Use epoxy glue to attach a leather strap onto the front of each can as a name tag. Thank you Magda for sharing your project!